More Than Just a Bowl of Cherries…. I hope you are enjoying your summer so far, but if you live in any part of the country that is going through a heatwave, torrential rain or tornadoes, stay safe. Bob and I planned on cleaning out the attic of old holiday decorations this weekend. (I have so many items). I just can’t believe how much I have accumulated over the past 20 years. I used to decorate the entire house for every holiday when my son was small. Now he is a man with his own house and I don’t use half the decorations I have, so it’s time to say goodbye to clutter. Because of the heat we postponed the attic cleaning for another day. Bob insisted on going up in the attic for a few minutes just to count how many boxes we had and came down with a small brown unmarked taped box. He asked what this was that was sitting alone in the corner of the attic and I had no clue. I have to tell you, it felt like Christmas morning opening this box with the excitement of a surprise. Once I opened it, I found some of my mother’s dishes. 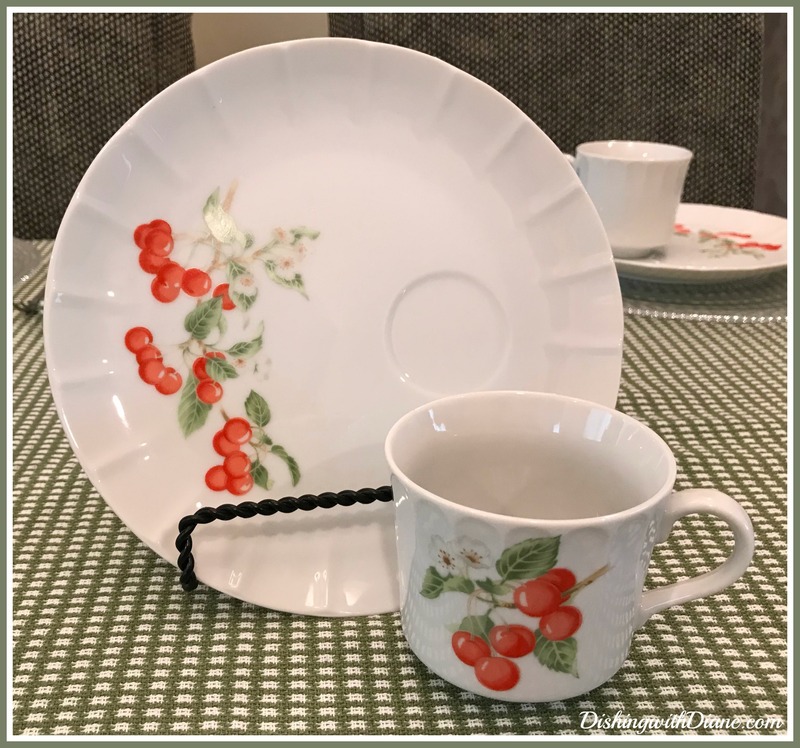 A dish I loved as a little girl, a combination snack plate & cup “cherry” dish. This brought back a flood of memories for me. My mother and I had many breakfasts on the back patio with these dishes. I always thought they were so fancy when I was a child. They are fine china from Japan, part of the Toscany Collection and the pattern name is “Marischino”. They are now considered vintage! I am the youngest of three daughters and there was a 14 & 11 year age gap between me and my sisters. When my sisters were in school, I was still home with mom. 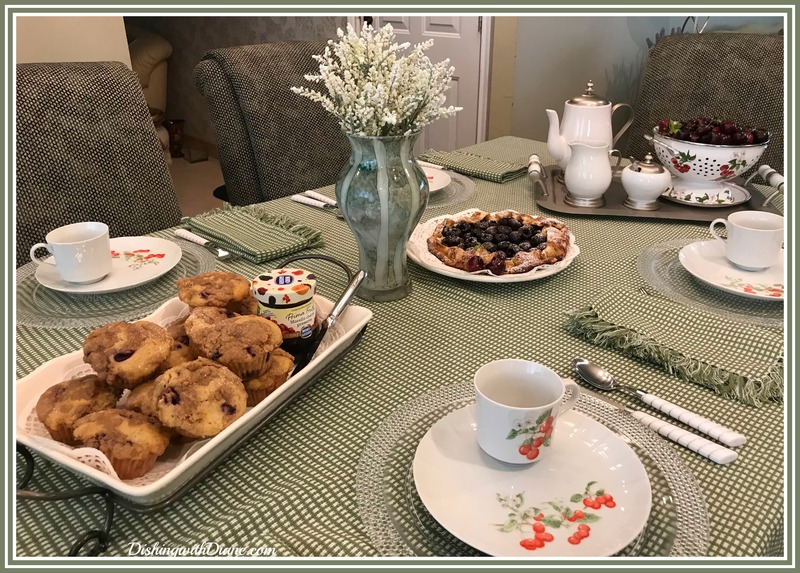 My mother would make wonderful muffins and pound cakes and she used these dishes for us to have breakfast on the back patio with her baked goods. That was a real treat not having the usual cereal, oatmeal or eggs. We would go out early morning once my sisters left for school and just enjoyed nature and listening to the birds chirping. The time of day when the rest of the world is still asleep and the dew is still on the grass. I wanted to use these dishes right away and since I just bought the most delicious cherries in Whole Foods, this was meant to be. I don’t have any of my mother’s baked goods recipes but I do know how to make a cherry crostata and that is fairly easy so I was off. I always keep an extra store bought pie dough in the refrigerator whenever I want a crostata or if I get unexpected company and I need something quick, so I was well prepared. I pitted the cherries and started the baking. I decided to make some cherry crumb muffins while I was at it and serve it with Morello cherry preserves. (Both recipes can be found at the end of this post). While the crostata and muffins were baking I carefully washed each plate and cup and then set a quick simple table. I would have had breakfast on the patio like mom and I did back in the day, but Bob would never be able to handle the heat even for a short period of time. Even the patio umbrella wouldn’t have helped him. I love hot weather but my honey needs air conditioning, so we had breakfast indoors. 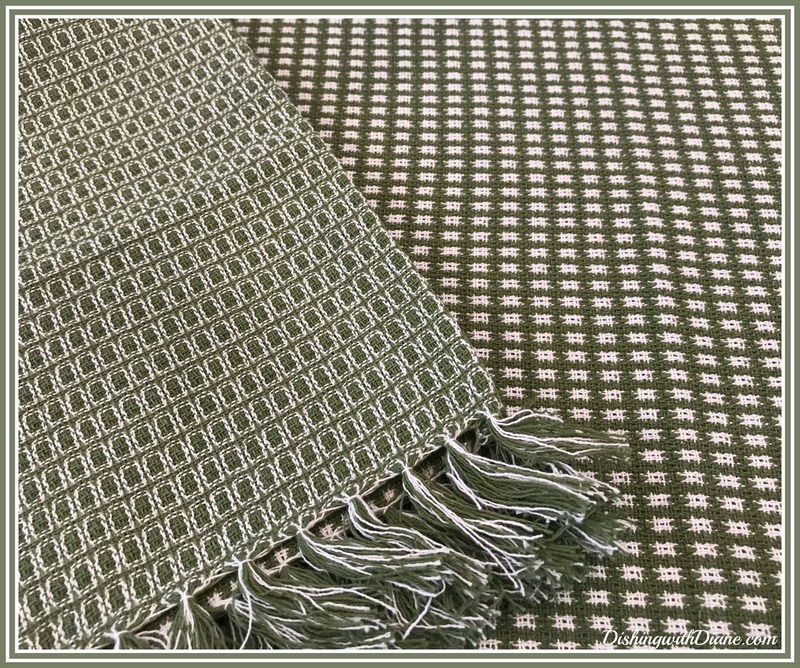 I used a sage green and white woven tablecloth with matching napkins. 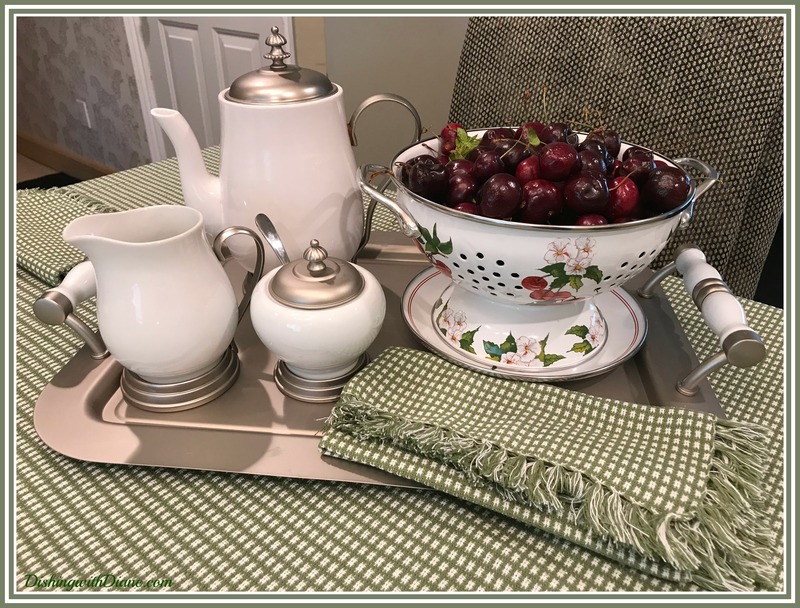 I love this particular tablecloth and napkin set because the pattern is reversible and I get a lot of use out of it. I wanted to highlight the dishes a little more and I didn’t quite have the right color placemat so I went with a glass charger instead. 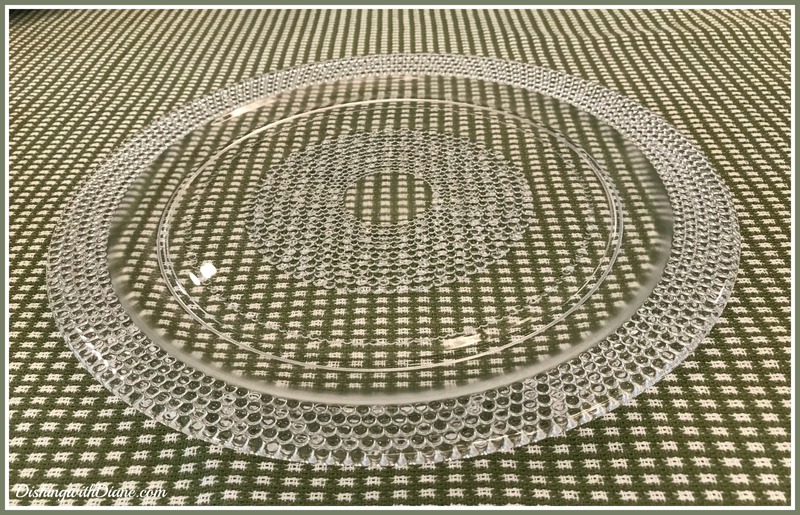 The charger has a little beaded design around the rim which adds a little sparkle to the table and still lets you focus on the plate. 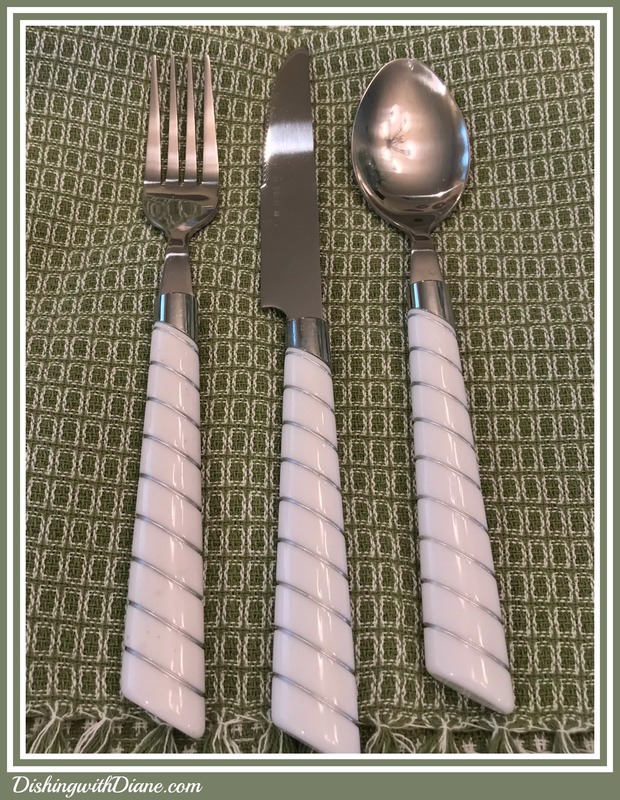 The flatware is white with silver threads running through it, very simple. This will match my tray and coffee accessories. I decided to put the coffee pot, creamer and sugar bowl on a separate tray. Having everything on the tray looks nice and neat. 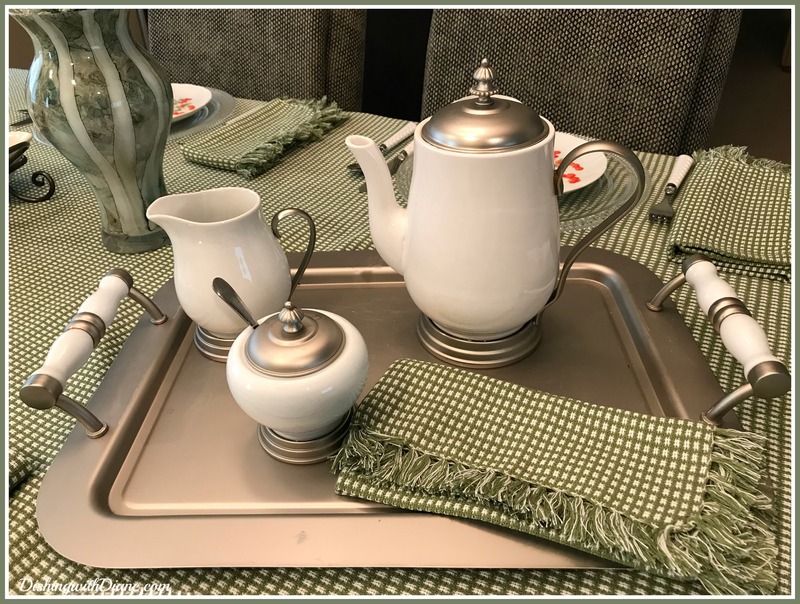 I have had this silver tray with white handles and matching coffee pot and accessories for 30 years since I got married. It has seen a lot of tablescapes. 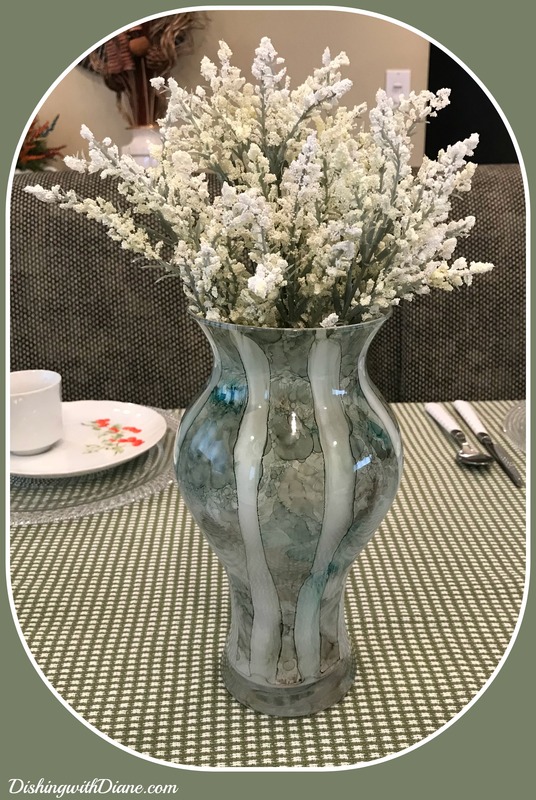 No breakfast table is complete without flowers, so I added some white heather to a new vase I just bought. I keep a box in my garage cabinet of all artificial flowers that I use for my tablescapes and this bunch was just right. This vase is my new Homegoods find that I am in love with. A vase from Italy for $7.99. I loved the pattern the minute I saw it and it was perfect because I incorporate the color green in a lot of my tables. The only downfall is that it is very thin (that is what you get for $7.99), so you have to be extra careful with it. 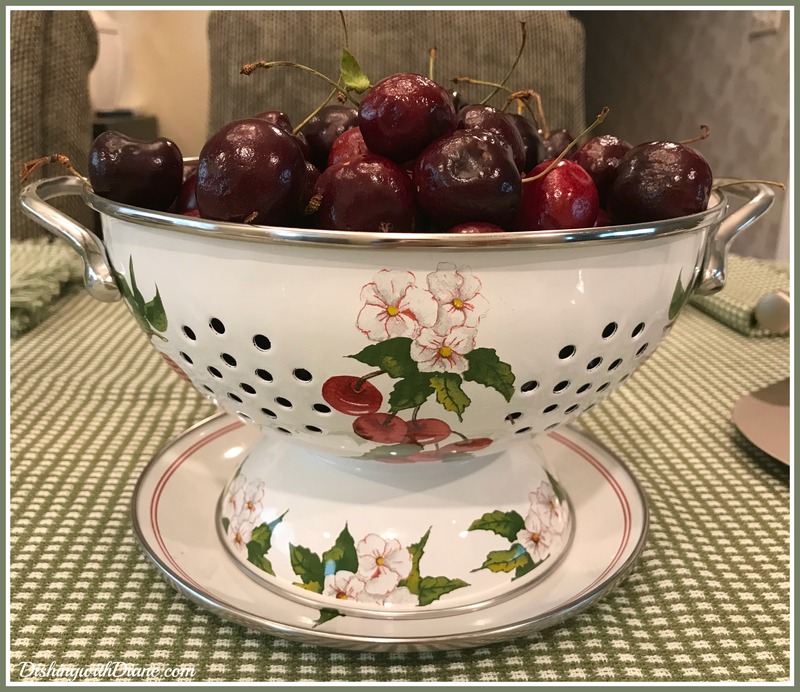 In addition to my floral centerpiece, I thought a bowl with fresh cherries would look lovely as an addition to the table. Instead of a fruit bowl, I thought of something else I could use. I received this 1 qt. 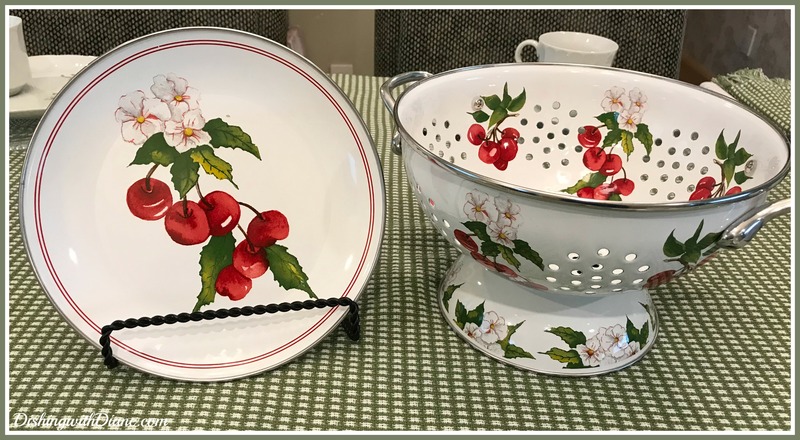 enamelware colander for Christmas last year and thought of it immediately because it has a cherry design. This colander is wonderful because it comes with a drain plate so you can leave your washed fruit on the table. 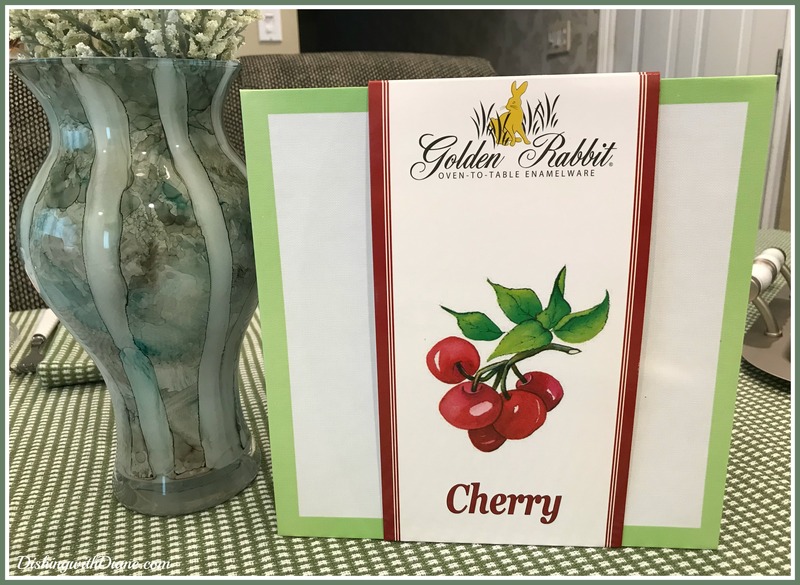 It is part of the Barbara Gullett collection for the company Golden Rabbit. In addition to the cherry design, it comes in blackberry, herbs, lettuce, radish and strawberry. I know I sound like an ad for the company but I am not being paid by them, I just love this product. While I am at it, even the box is beautiful if you give it as a gift. Okay, I’m done. If you have a similar decorative colander and don’t want to use it to serve fresh fruit on your table, use it for a floral arrangement. Colanders looks nice in the summer filled with sunflowers or daisies. Breakfast was delicious and Bob loved having cake for breakfast. 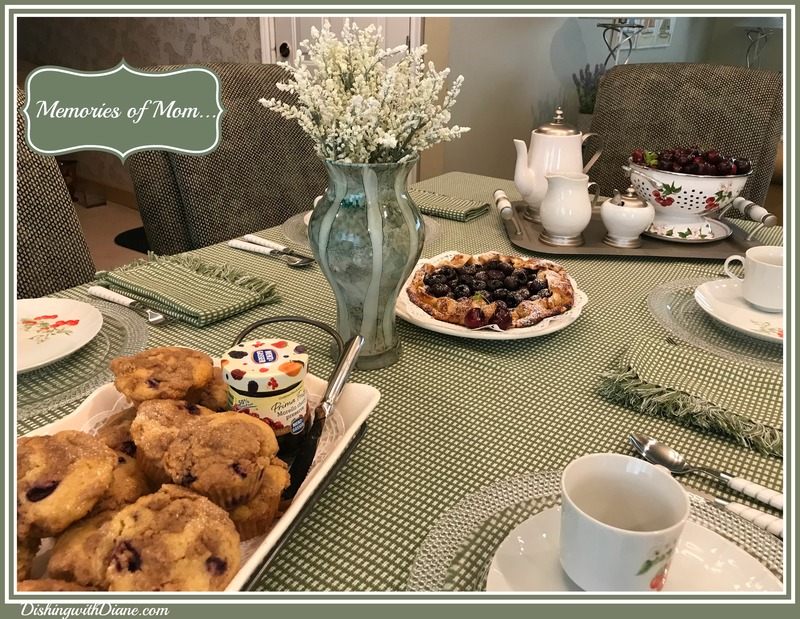 I felt like I was a little girl back in time, having breakfast with mom. I hope you enjoyed discovering along with me, one of my buried treasures from my mother. In a large bowl, add the cherries, orange juice, zest, cornstarch, sugar and a pinch of salt, and mix thoroughly to combine. On a lightly floured surface, roll dough out to a 10-inch circle, about 1/4-inch thick. Transfer dough to a baking sheet lined with parchment paper. Cooks Note: sprinkle a layer of very fine breadcrumbs on the dough before you add the cherry mixture. This will prevent the bottom of the crostata from getting soggy from any of the cherry juice. Pour cherry mixture into the middle of the dough, leaving a 1-inch border. Fold the edges of the dough over the fruit to enclose and make a 2-inch crust all the way around the crostata. Fan the edge as you go around folding the dough. In a small bowl, mix together the marmalade and water. Brush the marmalade mixture onto the 2-inch crust. Sprinkle crust with turbinado sugar. Place the pat of butter on top of the fruit mixture. 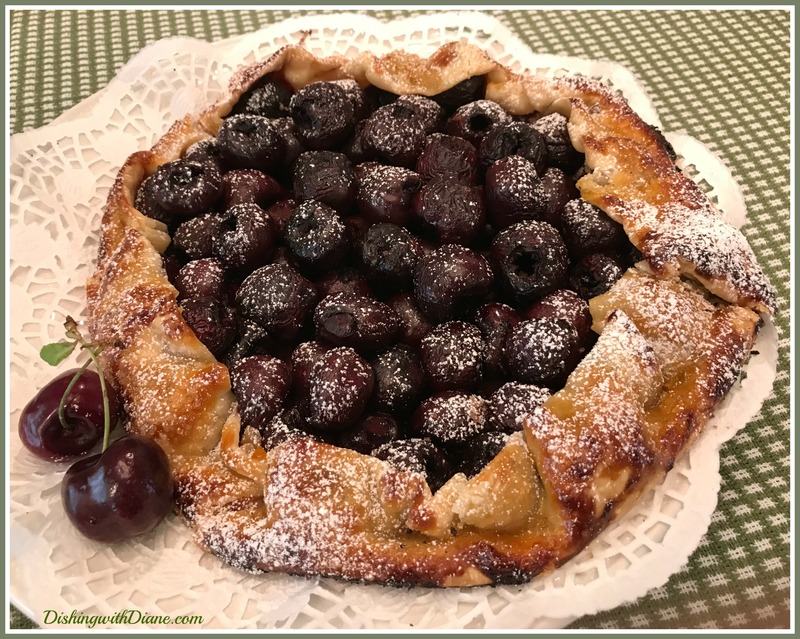 Bake crostata until the crust is golden brown and the fruit is tender, about 25-30 minutes. Remove from oven and let cool at least 15 minutes. Cooks Note: Use store-bought frozen and thawed cherries for a shortcut! Using kitchen shears, trim dough to a 1-inch overhang. Fold under itself to form a rim and press to seal. Using thumb and forefinger, crimp rim of crust. Refrigerate until ready to use, up to 1 day. Adapted from a blueberry crumb recipe for the website KITCHEN GENIUS. Preheat oven to 375 degrees F. Line or butter muffin tin. To make topping: put flour, brown sugar, and cinnamon in a small bowl and toss together. Add in the cold butter bits, and toss to coat, then use your fingers to rub the butter into the dry ingredients until you have irregularly shaped crumbs. Set aside the mix in the refrigerator while you prepare the batter. For the batter: In a large bowl, whisk together the flour, sugar, baking powder, and salt. Stir in the brown sugar. In another bowl, whisk the melted butter, eggs, milk, and vanilla together until well combined. Pour the liquid ingredients into the dry, and fold together quickly to blend. Fold in the cherries. The batter will be lumpy. 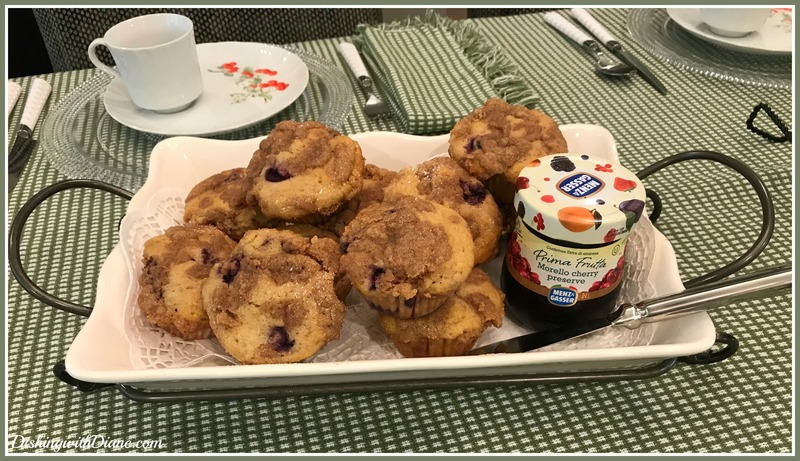 Divide the batter evenly between the muffin cups, sprinkle some topping over each muffin, and use your fingertips to gently press the crumbs into the batter. Bake for about 20 minutes, or until the tops are golden and a thin knife inserted into the center of the muffins comes out clean. Cool for 5 minutes before removing from the tin. Thank you for visiting my blog. Please spread the word to your family and friends to join DishingwithDiane either via email or Facebook. This entry was posted in Breakfast, Desserts on July 23, 2018 by aries041158. Such a beautiful and heartfelt post, Diane! meal served on a creative tablescape. Thank you so much for your lovely compliment Kimberly. I enjoy sharing my memories and recipes, food was a special part of my childhood. Food is love. Thank you so much for being a member and reading the blog. Please ask your friends to join, the more the merrier. Stay well, Diane. 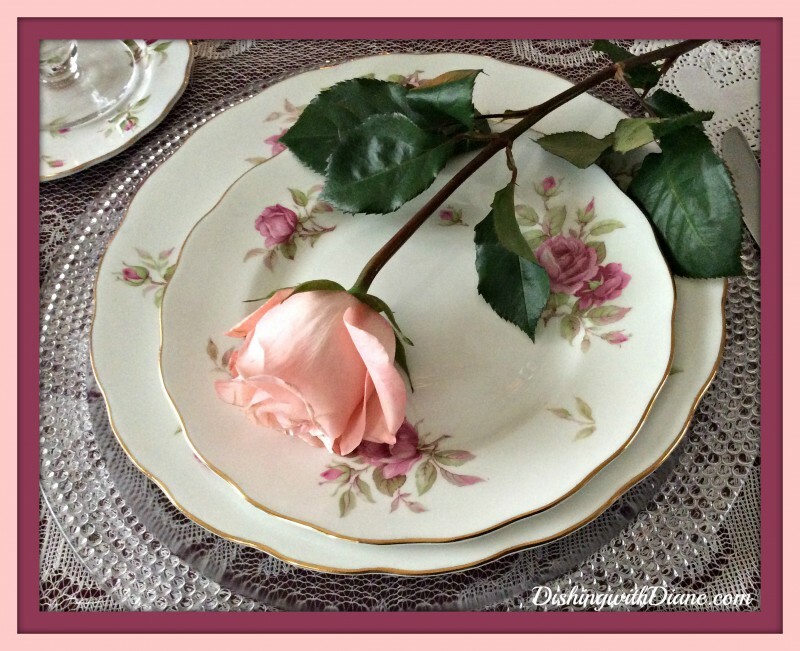 These dishes brought back so many memories of my mom. She was the absolute best. I am so happy I have some of her dishes. Thank you Linda for all of your sweet compliments. I am so glad that you like the tablescapes. I have so much fun putting them together and so much enjoyment when people write to me that they enjoy them. Thank you for supporting the blog from day one.